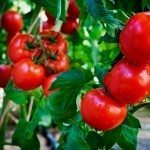 Am I watering my potted tomato plants too much? Some leaves are turning black and yellow. The tomatoes are starting to bear fruit. I am watering from the bottom and the water is absorbed very quickly. 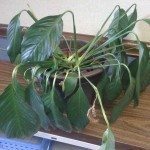 Yellowing leaves can indicate stressed plants and watering issues. To much or to little. Container plants generally need more water. Twice daily even if temperatures are above 85 degrees. Actually check the soil to make sure it is damp but not soggy. Make sure the pot has adequate drainage. Water from the top (avoid splashing the leaves) and make sure the water goes all the way to the bottom of the pot. The black leaves could be signs of a fungus so treat with Neem Oil.